If it were up to me, I’d require school every district to provide teachers with professional development on how to use Pinterest in their classrooms. Why? Because it is the most convenient, most efficient, and most inspirational professional learning community on the planet. That’s a pretty bold claim, I know. But there’s plenty of evidence to back it up - starting with every teacher’s need to share ideas that change students’ lives and ending with every teacher's ongoing quest to find that next “magic” lesson. They write blogs about lessons that motivate reluctant learners. They photograph and post student-friendly projects. They make video tutorials of strategies in action. They even create thousands of lessons that fellow teachers can access for free. Usually, it’s a small token of their appreciation to honor the teachers whose online teaching tips have enhanced their own craft. It's a way for them to pay it forward. And what is the most popular place for educators to spread all this good will? Yep. You guessed it...on Pinterest. #8 To keep up with trends. I have personally created boards which help me teach and review challenging topics like Complex Sentences, Point of View, Power Verbs and Adjectives, and Quotation Writing. After conducting a mini-lesson, I simply pull up a Pinterest board and have students practice what they’ve learned. Since several English teachers use these lessons, I added teacher directions at the top of each board and student directions under each pin. These boards make engaging learning stations and are great for independent work as well! Finding that just-right video to use with my students is like finding the perfect card for a special friend. When I find a video that can get my message across in a more memorable way than I could deliver it, I feel all tingly inside. This video clip on summarizing is a delightful example of how to write a bare-bones summary. I never get tired of it. And when I remind students later in the year to summarize like a New York City cop, they know exactly what I mean. Another one of my favorites on literary devices is hosted by an easy-on-the-eyes host who identifies himself simply as Paul. I don’t know if Paul is a teacher or an actor, but I do know that his presentation is engaging and his delivery is flawless. See what I mean…tingles. Videos don’t have to be professional to be useful. Here is one I made on Printing with Post Its - after reading a blog post written by a Studio DIY blogger who used Post Its to display a Happy Anniversary message on a wall to surprise her husband. Sappy? Maybe. But I still think about that anniversary image whenever I print lessons on Post Its. I had so much fun incorporating Post Its into my own lessons that I made a video tutorial to share my new-found obsession with my online teacher friends. Evidently, a lot of teachers felt the same way I did when I realized that Post It Printing was possible - because as of this posting, almost 200k teachers have viewed this one-minute video. If you watch it and like the idea, you can download the standard size Post It template here for free. I file all my videos on two Pinterest boards. Then I move the video I need to the top of the board the day before I want to use it. Voila! Easy access. Instant organization. Creative mini-lesson. 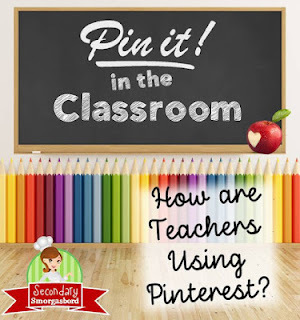 So there you have it: my top 2 tips for using Pinterest in my classroom. If you have a favorite tip for using Pinterest in your classroom, please share it here! Get more ideas about using Pinterest as part of your teaching practice by checking out the secondary blogs below - courtesy of this blog hop/linky hosted by ELA Buffet and Desktop Learning Adventures. Oh my gosh, Janice! This is so helpful! I absolutely agree - Pinterest truly is a goldmine for teacher development. Thanks for sharing this awesome content! Janice, you were one of the first pinners I ever followed on Pinterest, and you are still one of my all time favorite pinners. When I saw you post the Common Core Standards on the pins, I was blown away by your brilliance! You ROCK the Pinterest world! Thank you! Wow...thanks, Darlene. You just made my day! Great list! You've got some great boards. I can't wait to check them out. Your boards are great, too!